Presentations including talks, hands on activities, and field trips were given at many schools in southern Arizona and western Mexico including Jalisco, Sinaloa, and Sonora. The Education Outreach Program also conducted training workshops for teachers throughout Sonora and Arizona. 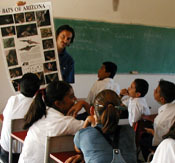 In Tucson, the pollinator education materials were pilot-tested on numerous schools, and included in teacher education programs. 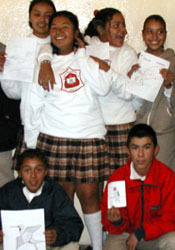 Presentations were also made at schools in Sierra Vista, Arizona. ASDM has provided schools on the Tohono O'odham Indian Reservation (an important area for bats and doves) with desert environmental education programs including materials on pollinators. Talks were given in Hermosillo to secondary school level students at the Centro Ecol�gico. ASDM conducted teacher training workshops reaching approximately 139 teachers in 96 schools. This course covered pollination biology, migratory routes, pollinator importance/value, threats and conservation, and identification of pollinators and key floral resources. ASDM staff made presentations on the climate and natural history of the Sonoran Desert, pollination biology, migration, hummingbirds, and bats that reached more than 2,000 students in Sonora. Hummingbird feeders and sugar were distributed to all schools where presentations were made. Teachers collected plant and hummingbird data for the Migratory Pollinator Project. Students drew hummingbirds, white-winged doves, butterflies, or bats. On the back of the cards they wrote Christmas messages, something about the animal that they drew, and their names and the schools. The cards were exchanged with students in other participating schools. Biologists from ASDM and the Universidad de Sonora and educators from CEDO in Puerto Pe�asco and the Centro Ecol�gico de Sonora in Hermosillo gave presentations at a workshop in San Ignacio, Sonora attended by 32 teachers. In addition to the presentations, there were various activities including bird watching, hummingbird banding, listening to bat echoes at night, observing insects at night, and star-gazing. Each teacher received a set of materials related to the natural history and conservation of the Sonoran Desert including books, computer materials, brochures, and seed packets for wildflower gardens. Teachers evaluated the program and were given an official diploma from the Secretar�a de Educaci�n y Cultura in Hermosillo that awards points toward their salaries for their participation in this training course. ASDM, Centro Intercultural para de Estudios de Des�ertos y Oc�anos (CEDO), and Bat Conservation International (BCI) conducted a workshop entitled "Migratory Pollinators in the Sonoran Desert," a 22 hour certification based teacher training session at CEDO (Puerto Pe�asco). The workshop included a field trip to the Pinacate Biosphere Reserve (35 teachers from Sonoyta, Caborca, and Puerto Pe�asco, and 5 staff from the Pinacate Biosphere Reserve attended). The program funded follow-up field trips for teachers and their students to experience the natural area first hand and observe pollinators in their habitats. Pronatura Sonora, one of our partners in this project, coordinated educational programs in schools in Guaymas and Empalme. Traveling pollinator "trunks" containing pollinator information, activities, and stories, were developed and distributed to 52 schools reaching more than 2,500 students through a team of 16 trained teachers. Pollination wisdom, migration challenges, habitat and conservation, and people, nature, and culture were the focus of the education program. 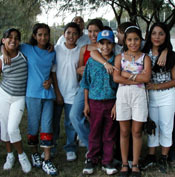 Another partner, Instituto del Medio Ambiente y el Desarrollo Sustentable del Estado de Sonora (IMADES), developed different education outreach approaches in the town of Alamos, Sonora. This town is popular with eco-tourists and attracts Leptonycteris bats and hummingbirds. Talks were given to students in schools and at conferences at Centro Ecol�gico. 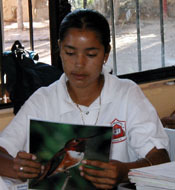 In Jalisco State, ASDM and the Programa de Conservaci�n de Murci�lagos Migratorios (PCMM) jointly focused their education programs in communities near where Leptonycteris bat roosts are located, and in communities near agave plantations (important floral resource for bats and hummingbirds). 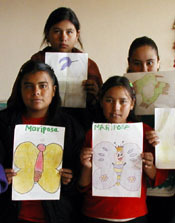 Communities included Amatit�n-Tequila, Ajijic, Techaluta de Montenegro and Guadalajara. Education materials were distributed and presentations were made to community members at a variety of community centers including libraries, museums, civic centers, restaurants, Bed & Breakfasts, ranches, clubs, etc. Local residents and business owners were encouraged to pass out materials to tourists and other residents as well as collect data for the Migratory Pollinators Program. In Punta Chueca and Desemboque, Seri Indians through the ASDM para-ecologist training program, received instruction in mist-netting techniques for bats and hummingbirds and how to identify which type of bat is occupying particular roost caves. Packages with brochures, pollinator educational materials, and field data collection forms were sent to hotels, non-governmental organizations, individuals, and government organizations in Sonora, Chihuahua, and Sinaloa, Mexico. These groups/businesses have become "Partners in Pollination" passing out pollination brochures and information as well as providing the Migratory Pollinator Program with pollinator data from their sites. Migratory Pollinator Program workshops were conducted for the Arizona Bed & Breakfast Association with emphasis on data collection ("Partners in Pollination") and the use of native plants in gardens. Pronatura Sonora organized a pollination mass media campaign including spots on radio, television and in state and local newspapers. IMADES gave community pollination talks in Alamos in a local museum, at the Delegation of Tourism, at the local Cattle Raisers Association meeting, and at several non profit offices, and at the Municipal Office. They passed out brochures and information as well as recruited many of these groups to pass out more flyers. They prepared radio talks and gave a talk during the National Week of Science and Technology in Hermosillo. ASDM and PCMM gave community presentations in Jalisco State and met with the Tequila Industry Chamber of Commerce and locals associated with a Tequila Museum and an ecotourist train, the Tequila Express, to encourage bat/agave education and conservation. A bilingual poster and educational project for small farmers teaching the advantages of wild habitat around farms to attract pollinators is in preparation by The Bee Works and ASDM. Encouragement of nectar-rich resource oases has been an emphasis of the Outreach Program. The Migratory Pollinator Program promotes the establishment of pollinator gardens as habitats that can provide shelter, food, and water for migratory species. These gardens are used as observation sites for research and provide an opportunity to educate local communities and encourage participation in conservation efforts. Emphasized pollinator gardens in Migratory Pollinator workshops for Arizona Bed & Breakfast Association to motivate them to plant native plants. Provided technical and material support to establish a pollinator garden at San Xavier Community Center (Tohono O'odham Nation). Provided technical and material support to establish pollinator gardens at 6 schools/sites in Arizona and Sonora, Mexico. Provided technical support to the Sonoran Institute to establish a pollinator garden in a Santa Cruz River community in Sonora, Mexico. Book on schoolyard habitat design for the arid southwest. Pollinator Garden Website (in preparation). North American Association for Environmental Education (NAAEE) conference, South Padre Island, TX 2000. National Association for Interpretation (NAI) Conference, Tucson, AZ 2000. Yuma Birding and Nature Festival, Yuma, AZ 2001. Ironwood Festival, Tucson, AZ 2001, 2002. Southwest Wings Festival, Sierra Vista, AZ 2000, 2001. Arizona Bat Conservation and Management Workshop, Portal, AZ 2001. Hummingbird Banding Conference, Silver City, NM 2001. The Education and Community Outreach portion of this program has been an outstanding success. We were overwhelmed with the positive responses from students, teachers, local landowners, businesses, and civic groups. Interest in pollinator issues and a desire to participate in research and conservation efforts exists across the entire migratory pollinator region. Teachers traveled great distances to attend the workshops and frequently parents came to school with their children to hear the presentations. Businesses, landowners, and civic groups were eager to offer their knowledge of local natural history and to hang hummingbird feeders, plant pollinator gardens, and pass out literature. Our education efforts have served to focus attention on the importance of pollinators and the role of local people in the preservation of pollinator habitats. We have been able to provide information and assistance in the creation of community-based data gathering and monitoring. We plan to continue supporting community efforts to develop sustainable practices along migratory corridors and to reinforcing the importance of community action in conservation.